Humans and heavy-duty robots working together in a shared non-enclosed space is currently extremely dangerous. time of Hannover Messe 2017, it has now entered industrial reality: a manufacturer of sanitary facilities in the region of the Ore Mountains in Saxony uses this concept to spare the employees from heavy-duty work. The four colleagues made of steel sort heavy steel frames onto transport frames. As a result, the cycle time of the plant has been reduced by 50 percent and the ergonomic aspects have been considerably improved. 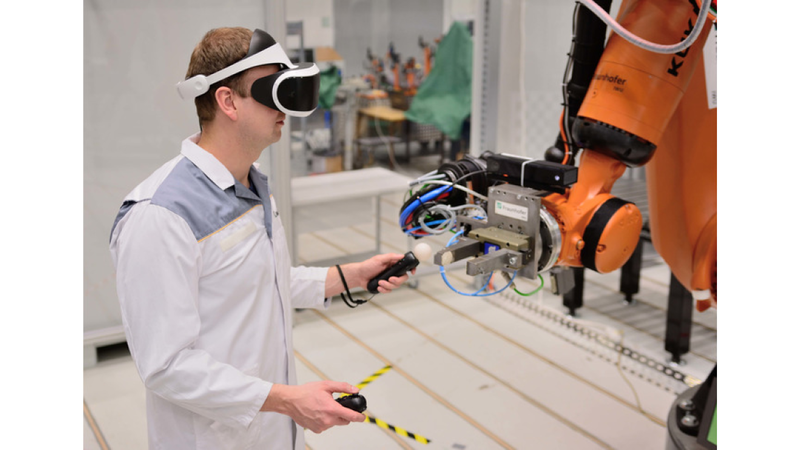 Using VR glasses, visitors can interact with a virtual heavy-duty robot at full speed and experience the convincing safety of the system.